You are here: Home 2012 May Good and bad cholesterol – worth a second look. Dr. Weeks’ Comment: Good ain’t all good; Bad ain’t all bad. Black and white. Things really are not that simple. Each of the variants Kathiresan and his colleagues studied reflects potentially distinct ways the body might raise HDL. The findings raise significant questions about whether developing drugs against the genes explored in this study, which involves an international team of investigators to bring together patient samples, will prove effective in lowering heart attack risk across the population. In the blood, cholesterol is carried by particles called lipoproteins, which come in different sizes and densities. These include HDL, or high-density lipoprotein, and LDL, or low-density lipoprotein. There is a well-studied connection between elevated LDL, often called the “bad cholesterol,” and heart attack. Decades of research, including studies of genetic disorders in humans and the discovery of the LDL receptor and its role in cholesterol regulation, paved the way for the development of life-saving drugs known as statins. This work showed beyond any reasonable doubt that many different methods of reducing a person’s LDL levels lower the risk of heart disease. Large-scale studies of genetic variation tied to LDL have been revealing, but the data on HDL are not so clear. More than 30 years ago, human epidemiological studies first revealed an association between HDL and risk for heart attack: the higher the levels, the lower the risk. Experiments in cells and mice further support the idea and suggest that HDL is protective because it may remove cholesterol from the sites where it can do damage. 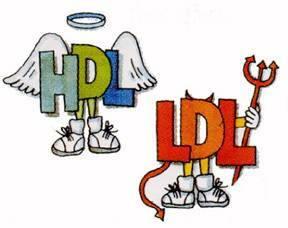 However, it has been difficult for researchers to prove conclusively that raising HDL levels is beneficial, primarily for two reasons. First, studies of human genetic diseases where individuals have very low HDL levels have not yielded definitive answers as to the impact on heart attack. And second, because there are currently no drugs that specifically elevate HDL levels, it has been difficult to prove in humans that such an intervention will lower heart attack risk. To investigate, Kathiresan teamed up with colleagues from MGH, the Broad Institute, and beyond, including Voight and co-first author Gina Peloso. Together, the researchers looked to the human genome for help. Individuals typically carry two copies of each gene in the genome; which copy a child will inherit from each parent is essentially a random decision, like flipping a coin. This phenomenon, sometimes called “Mendelian randomization,” provides a powerful means of testing connections between genes, biomarkers, and disease — similar to the way that randomized controlled clinical trials can evaluate the effectiveness of new drugs. Using this technique, researchers study two groups of people — those who carry a particular gene variant, and those who do not. When sufficiently large groups are studied, both groups should be similar in every factor, except for the specific gene variant or biomarker of interest, allowing researchers to home in on whether the biomarker actually causes a particular trait or condition. By harnessing this method, Kathiresan and his team tested whether certain genetic variants that can dial up a person’s HDL levels impact the chances of developing heart attack. What they found was surprising. Individuals who carried a particular variation in a gene called endothelial lipase had HDL levels that were elevated about 6mg/dl, or 10% — a change expected to decrease heart attack risk by about 13%. However, these individuals showed no difference in their risk of heart disease compared to people without the variant. Similarly, the researchers identified a panel composed of not just one but 14 different HDL-raising variants. They devised a scoring system based on the total number of copies of the gene variants a person carries — ranging from 0 to 28 — and then asked whether that score relates to the risk of heart attack. Here also they uncovered no association. Other study contributors from the Broad Institute include Christopher Newton-Cheh, Kiran Musunuru, James Pirruccello, Paul de Bakker, Mark Daly, Candace Guiducci, Noel Burtt, Aarti Surti, Elena Gonzalez, Shaun Purcell, and Stacey Gabriel. This work was funded by the National Institutes of Health, The Wellcome Trust, European Union, British Heart Foundation and the German Federal Ministry of Education and Research. Low “bad” cholesterol is a risk of cancer. One Response to "Good and bad cholesterol – worth a second look."